CATALOG: How do I create an EZ Username? For a short video tutorial on how to create your EZ Username, click here. 1. From the Catalog, click "Log In" in the upper right, then enter your Library Card Account Number and Last Name; click "log in." 3. Click "EZ Login" in the left menu. Enter your desired username. Enter your password twice to confirm, then click "save." 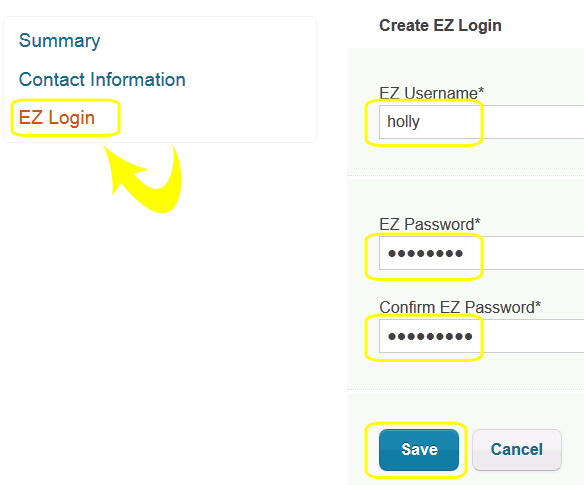 The next time you login, you can use your EZ Login or your Library Card account number.